Matt Machan says he is relieved now that he has taken the tough decision to call time on his career. The Sussex and Scotland batsman has succumbed to a wrist injury which has been troubling him since May 2016. He attempted a low-level comeback in mid-May, during a net session at Hove, he felt pain in the wrist again and knew enough was enough. He announced his decision last week. Machan can look back on a solid career. Associated with Sussex since the age of ten, he wasn’t quite old enough to play in Chris Adams’ successful sides of the last decade but by 2015, when he scored three Championship hundreds in the First Division, he had begun to establish himself in Sussex’s middle order as a pugnacious competitor always looking to take on the bowlers. 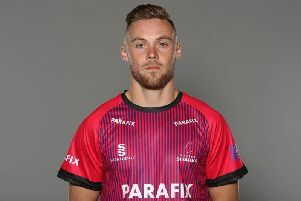 He was also a key member of Sussex’s white ball team and in 2013 had made his Scotland debut - his mother is from Glasgow - and went on to play in two World Cups and represent his country 39 times. “I don’t think playing in the World Cup, especially the 2015 edition in New Zealand and Australia, would have been topped if I’d played for another ten years,” he said. “That was a fantastic experience and I have some great memories. Machan would like to stay in the game in a coaching capacity and has already had some offers, but for now he likes the idea that for the first time since he joined the Sussex staff he can plan his own life rather than having to stick to the regimented schedules which are the lot of the professional cricketer.